Advocates arguing for stronger flow protections issued these photos of the Spokane River at contrasting flow levels. River protection advocates, recreational users and others have until 5 pm today to submit public comment on proposed instream flow minimums that could potentially impact wildlife habitat, fish spawning, paddling access and other important river functions. The Department of Ecology released the proposed rules in September with flow minimums that closely reflect the minimums already agreed to in Avista Utilities’ 2009 federal license. Those allow a high-end minimum of 6,500 cubic feet per second during spring runoff from April to June. But most advocates have voiced concerns about the low-end minimum of just 850 cfs in dry summer months from June to September. 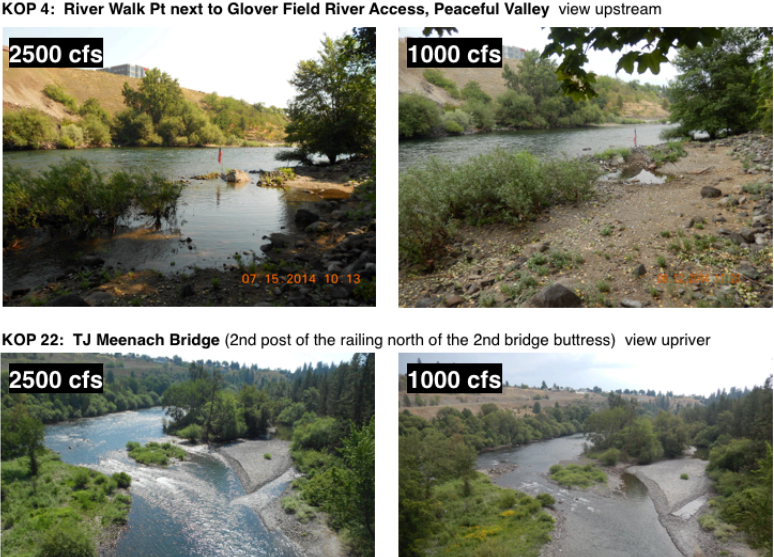 The Center for Environmental Law & Policy released a series of side-by-side comparative photos yesterday to help illustrate the visual difference between 2,000 cfs and the lower 1,000 cfs. We took an in-depth look at the water quality history of the Spokane River in October, noting many of the challenges facing fish and wildlife along its banks. Many agencies have worked to take on those issues. Avista officials say the flow standards were carefully negotiated to protect fish spawning throughout the system, but advocates argue the minimum flows run too shallow for fish protection and consistent recreation. You can read existing comments, and contribute your own with this online form. Commenting closes at 5 pm today.